Athletic Director Mark Conroy presented the Athletic Awards during the spring athletic assembly on May 26. The program recognized the individual spring teams that finished their seasons and honored the Class of 2017’s participation in the athletic program. A slideshow celebrated a year in Wildcat Athletics. See photos of the assembly here. And watch a video made by student Soma Mizobuchi ’17 that summarizes track and field life at Williston! A small handful of Williston students rode this spring at Fuller Horse Farm in Westhampton under the guidance of Laura Etzel. The team was led by senior veteran rider Alex Foster. According to Laura, these athletes showed great determination and dedication in working towards achieving their individual riding and horsemanship goals. Mr. Conroy recognized the riders who won awards at the Banquet Night on Tuesday. It was an exciting spring season on the Connecticut River for those Williston students who participated on the Northampton Community crew team. The club recently expanded and created a middle school “learn to row” sculling program. Gabriel Davila Bustamante and Andy Cao were part of the inaugural class of middle school scullers. Sophomore Caleb Stern earned a spot in the Varsity Eight which is the most competitive boat at Hamp Crew. The Varsity Eight had their best finish of the season at the Saratoga Invitational in New York placing 6th in the final. Senior Michael Lemme is the most veteran rower of the group and a member of the Varsity Four. The Varsity Four had their best finish at the Pioneer Valley Championships in Holyoke finishing in 2nd place. Overall, it was a successful spring season for our rowers. -Led by Coach Alex Tancrell-Fontaine, the JV girls’ tennis team enjoyed a terrific winning season finishing with a 6-2 record highlighted by exciting victories over NMH, Suffield and Berkshire. -The varsity girls team, led by Coach John Chiavaroli, fielded a young team short on experience but long on enthusiasm. The team made significant improvement during the season. Highlights of their season were decisive wins over both Cushing and Wilbraham & Monson. -The season concluded at the 8 team Suffield Tournament held last Saturday. Three Williston girls, in particular, enjoyed great tournament performances. Sophomore Kate Quimby and senior Gabby Mercier were finalists at #1 doubles while junior Fuka Iwama had a terrific day winning the #1 singles title. Congratulations Fuka!!! -Our JV Baseball team led by Coaches Ketcham and Moyer made great strides throughout the season. This young team played competitive baseball all season long highlighted by several close games including hard fought victories over Cushing and Wilbraham & Monson. -The Varsity Baseball team, led by Coaches Sawyer, Beaton, and Shelffo had a competitive season playing in the Western New England Prep League. Highlights of their season included a season sweep of divisional rival Pomfret and a convincing home victory over Vermont. The team finished their season on a high note by traveling to Millbrook and coming home with a decisive 18-6 win avenging an earlier home game in which we were no hit. -Several players earned all-league recognition for their outstanding play: First Team honors went to freshman second baseman Jonathan Toth. Second team honors went to seniors Cody Cavanagh and Chris Espinal. Additionally, senior Ian Ostberg, who finished his season hitting .500, was named the recipient of the Cleary Division Player of the Year, a tremendous honor in our very competitive league. He is only the third Williston player to receive this honor joining former players Chad Adams ‘12 and his Ian’s older brother Erik ‘14. Ian came forward to receive special recognition. Mr. Conroy recognized the award winners and next year’s captains in the baseball program. – Coach Ken Choo’s JV tennis squad demonstrated a wonderful spirit and terrific improvement all season. – Despite fielding a younger team than expected this spring, Coach Ryan Tyree’s boys’ varsity tennis team enjoyed a very competitive season. Highlights of their season included decisive victories over Worcester, Millbrook, and Wilbraham & Monson and strong showings in losses to Loomis and Berkshire. Undoubtedly, the two biggest victories were thrilling 4-3 victories over both Gunnery and Westminster. The Westminster match came down to a tie-breaker between #1 singles players that 8th grader Nikhil Sierros pulled out by the narrowest of margins. The future remains very bright for boys tennis with the return of a solid nucleus including our top four singles players – Nikhil, freshman Kenny Wang, sophomore Joey Robbins and junior Nitish Raja. Mr. Conroy recognized the tennis program’s award winners and next year’s captain. Sportsmanship: Isi Donnelly ’21 – second year in a row! -Coach Liz Kay’s JV Girls Golf squad made steady progress throughout the season highlighted by a season sweep of rival Miss Hall’s. -Led by Coach Ann Pickrell, the 2017 Varsity Girls Golf Team compiled a 6-11-2 match play season record this spring. 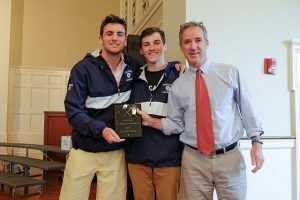 In a rebuilding year, the team highlights included decisive victories over Westminster and Miss Porter’s and narrow losses to Loomis and Choate. The team also hosted an inaugural alumni two ball match over Reunion weekend and teammates Sarah Sullivan and Atah Okaisabor won the event. Under the enthusiastic guidance of Coaches Alex Rivenburgh and Lee Greener, Williston’s Ultimate roster ballooned to 30 this spring. The team made great strides this season finishing with an excellent record of 12-6. Highlights of their winning season included big wins over Four Rivers and Frontier. According to Coach Rivenburgh, the biggest highlight of the season was the team’s performance at the NMH Invitational. The team went undefeated surrendering only 11 points on the day while scoring 30. For the season, senior Jaden Tanguay led the team in goals with 14 while Matt Seltzer led the team in assists with 22. With a strong youthful corps returning, Ultimate looks to build on this season’s success next spring. Two girls placed in the pole vault – seniors Emma Reynolds and Sophie Carrelas earned 5th and 6th place respectively. Senior Alexis Ryan had a fantastic day at the championships as a thrower. She finished 4th in the shot put, 2nd in the Discus and won the Javelin with a throw of 93’4”. This is the third year in a row that Alexis has won a NEPSAC individual throwing championship. Alexis received a special recognition for her achievement. Bert Aulean who took 6th in the Discus. The 4 x 100 relay team of Jake Goodman, Derek Zhao, Greg Iverson and Jonathan Edwards that came in 5th. Andrew Marshall who took 5th in the Javelin. Justin Park with a 5th in the Shot Put. Duncan LeXander with a 5th in the High Jump. Abood Abuissa took 4th in the high hurdles. Elijah Hutchinson who took 4th in the 200 and 2nd in the 400. Senior Eni Ikuku took 2nd in the Long Jump. Deserving special recognition this morning is the 4 x 400 relay team of Jake Goodman, Greg Iverson, Oskar Lee and Elijah Hutchinson that ran a 3:31.98 race to become NEPSAC champions! Mr. Conroy recognized the members of the relay team. -Led by Coaches Amber Rodgers, Erin Davey and Allison Marsland, varsity softball enjoyed a terrific season finishing with a record of 12-3, the 12 wins equals the 2001 squad for most wins in a single season in our program’s history. The team started its season by splitting their first four games before getting on a roll winning 10 games in a row. Highlights of this streak included beating an undefeated Class B champion Cheshire squad, terrific wins over KO and Suffield and a thrilling 1-0 road win at Ethel Walker. Offensively, the team was led Jordan Strum, Gabby Jones and Jersey Strum. This trio combined for 6 home runs during the season. Junior pitcher Jordan Strum continued her dominant career by striking out 139 batters – just under 10 a game. In what was certainly a highlight of the season, Jordan threw a “perfect game” at Stoneleigh Burnham facing the minimum 21 batters striking out 15 of them. In recognition of this very rare accomplishment, Jordan received special recognition. For the fourth year in a row the girls qualified for the Western New England Class A League Tournament – earning a #2 seed. The girls shut out Hopkins 5-0 at home to advance to the championship game at Westminster. Despite a terrific effort, particularly on defense, the team lost 2-0. For their outstanding play during the season, juniors Gabby Jones and Jordan Strum were both named league all-stars. To say it was a wonderful season for girls’ water polo would be an understatement! Despite last season’s record of 1-14, Coach Berghoff predicted that this team would make tremendous improvements though I think that the level of success they achieved surprised even him! The same team that won one game a year ago became the first Williston girls’ water polo team to make the NEPSAC Final Four tournament. The team’s nine wins sets a program record bettering the 8 wins of 2015. There were many highlights during the season including sweeping Loomis in both of their matches, a home tri-match sweep of Exeter and Choate, and a thrilling 11-10 overtime victory over Deerfield at the Babcock Pool. Our excellent regular season resulted in the team earning the #4 seed and the opportunity to host rival Choate. In a tremendous team win, the girls defeated Choate 9-4 to earn their first Final Four tournament berth. Despite their valiant efforts, the team came up short to #1 seeded Greenwich Academy in the semifinals. Abbie Coscia was named to the All Tournament team. -I do want to give special mention this morning to two young ladies who set school records this spring. Freshman Dylan Fulcher-Melendy had a terrific season in goal breaking the single season saves record set by Mary McCarthy two years ago with 196 saves. Additionally, sophomore Abbie Coscia continued her assault on the record books by not only topping her own single season scoring record with 80 this spring but also set the career scoring record with 183. Did I mention she has two seasons left? Abbie and Dylan came forward to receive special recognition. -JV Boys Lacrosse, led by the dynamic duo of Hanford and Johnson, had an excellent season with several wins to their credit including victories over Albany, Eaglebrook and Suffield. -Under Coaches Syfu and Dietrich, Varsity Boys Lacrosse finished with an overall record of 9-6 with a perfect 7-0 record in Western NE Division 2 to take home this league title. The team enjoyed some terrific wins including decisive victories over Gunnery, Suffield, and NMH. Undoubtedly, the two most exciting wins during the spring were overtime thrillers over Wilbraham & Monson and Canterbury. Against WMA, senior Brian Sullivan scored the game winner in sudden death while junior Mason Balch found the back of the net in overtime to defeat Canterbury. At the season ending Colonial Tournament held at Pomfret, the boys won a nail-biter over Gunnery 10-9 in the semi-finals to advance to the championship game vs the host Pomfret Griffins. In a rematch of an earlier season loss, the Wildcats played arguably their finest game of the season winning decisively 10-4 to capture the tournament championship. -In terms of postseason recognition, five boys were named to the all-league team: senior Will Fokas, juniors Mason Balch, John Kilcommons, and Rob Champigny and sophomore Joey Ford. Additionally, Mason was also named the recipient of the William LaBelle Offensive Player of the Year Award. Mason received special recognition for this achievement. Mr. Conroy recognized the award winners in the boys’ lacrosse program. -Girls Lacrosse at Williston had another outstanding season. The Thirds team, under the leadership of Sarah Sawyer and Mia Smith, demonstrated great team spirit and improvement throughout the season. The JV squad, led by Coaches Garrity and Baldwin, had another very successful season with big victories over Miss Porters, Pomfret and Suffield as highlights. – Led by Coaches Fulcher, Breidis and Moore, the Varsity Girls’ Lacrosse team had another outstanding season finishing with a 13-1 record with only a tough loss to Loomis separating them from an undefeated season. In the past nine years the girls’ lacrosse team is an incredible 125 – 8! -While there were many great wins during this season, there were several victories that stood out for Coach Fulcher. The first was a thrilling 12-11 victory at Hotchkiss decided by Fiona Bundy’s last second shot. Other big victories included allowing only one goal in an 11-1 victory over an always tough St. Mark’s squad, a terrific 20-10 win at Deerfield and a decisive 15-7 win over a talented NMH team. Undoubtedly, the most thrilling victory of the season took place in Wallingford, CT in early May when the girls played a terrific game beating a very strong Choate team 11-8 under their lights before their home crowd. In the final girls’ lacrosse rankings of NEPSAC schools on the website Lax Power that includes all 100+ prep schools that play girls lacrosse in New England, Williston was ranked #1 just ahead of Exeter, Choate and Loomis in that order. Pretty amazing! -In terms of postseason recognition senior Olivia Bonavita and juniors Fiona Bundy and Madison Fulcher-Melendy were recognized for their outstanding play by being named to the All Western New England all-star team. Congratulations girls! -The JV team, led by Coaches Whipple and Cunha, had a very competitive season finishing with several victories highlighted by wins over Suffield, Berkshire and NMH. -The Boys’ Varsity Golf team, under Coach Mike Fay’s leadership, had a historic season with a record of 20-1. The 20 wins is the most in school history bettering the mark of 16 set a year ago. The boys record the past two years is 36-4-1. Their only loss this season was to Loomis in a tie-breaker, a team we beat handily in another match. The team was led by co-captains Jacob Zaranek and Noah DeVos both of whom shot a 1 under par 35 in their final match to help the team to their best match score of the season. It was an incredible season for this team as their average margin of victory this spring was 17 strokes. Their match average of a 39 was a full stroke better than last year. The team enjoyed tremendous depth as 7 different players earned match medalist for the best score in a match in our 12 matches. It is worth noting that junior Jacob Durocher has the distinction of being the first varsity golfer in memory to record a hole-in-one in a match. Where is Jacob? Congratulations!!! -In the season ending Kingswood Invitational, senior Nick Randolph was team medalist for the Wildcats with a 73. The team ended up with a 4th place finish out of the 24 teams that competed. With the return of 7 varsity players next spring, their success is likely to continue in the 2018 season. Students at Williston are encouraged to participate and get engaged in all aspects of student life here. Many of our graduating seniors have made an exceptional commitment to participating in our competitive athletic program. To honor this distinguished level of participation, the Athletic Department presented a senior award, the Blanket Award, to recognize those students who have participated on a team every season during their junior and senior year. For students who have been at Williston for more than two years, they are eligible for the award if they missed only one season during either their freshman or sophomore year. The following 24 students received the Blanket Award. It is our privilege this morning to award our two most prestigious senior athletic awards. The George Denman Bowl for boys and the Alumnae Bowl for girls are “awarded to seniors whose contribution to the athletic program have been characterized by exceptional achievement, faithful participation, and loyal devotion to the best interests of the school.” The award is determined by a vote of our program’s head coaches. This year’s Denman recipient had a tremendous career at Williston during his six years here earning 11 letters. In the fall, he was a two time captain, four year starter and leading scorer for the water polo team. During the winter, it would be an understatement to say that he has been a significant contributor to our swim program. Here is just a sampling of his accolades as a swimmer – six year letter winner, five time team MVP, 7 time NEPSAC champion, nationally ranked in four events, current holder of 6 school individual records that he has broken numerous times during the past three years. Essentially, every time he jumped into a pool this winter he set a record! His tremendous accomplishments in our swim program make him arguably the most accomplished swimmer in our school’s history – he is the first Williston swimmer to be an All American in four different events – a testament to both his talent and versatility as a swimmer. Beyond these outstanding accomplishments, he is widely considered by his coaches not only as a fierce competitor but also as a humble supportive teammate and a wonderful role model for his younger teammates. It gives us great pleasure to award the 2017 Denman Award to David Fitch. The Alumnae Bowl recipient won 12 varsity letters during her four years at Williston. In the fall, she captained varsity field hockey from her defensive position where she was a four year stalwart- helping the team to a NEPSAC championship as a junior. During the winter, she was a huge contributor on defense to one of the most successful girls’ hockey stretches in the history of our school – during her four years at Williston, the team won 78 games. During the spring, she captained the track team while becoming one of the most dominant throwers in our school’s history. She won NEPSAC throwing titles during each of the last three years and is currently the school record holder in the discus. In this year’s NEPSAC championship she scored 22 of our teams 25 points! Beyond her outstanding accomplishments, she is considered by her coaches an incredibly reliable teammate and a great competitor. It gives us great pleasure to award this 2017 Alumnae Bowl to Alexis Ryan. Following the awards, Will Fokas and Saul Blain led those assembled in one last rousing chorus of the Sammy song!